Newly appointed as one of the three titular organists at Notre-Dame Cathedral in Paris, France, Vincent Dubois is one of the finest concert organists to appear on the world stage in many years. He is a graduate of the Conservatoire National Supérieur de Musique in Paris where he was a student of Olivier Latry, and earned First Prizes in Organ, Harmony, Counterpoint, Fugue and 20th-century composition. In January 2016, after a comprehensive audition and competition for the available post, Mr. Dubois was appointed the newest of three titular organists of Notre-Dame Cathedral in Paris, where he will serve along with the two other titular organists, Olivier Latry and Philippe Lefebvre. Mr. Dubois took the world’s stage early in his career when he won two major organ competitions in 2002: the Recital Gold Medal at the 2002 Calgary International Organ Competition, and the Grand Prize at the 2002 International Competition of Toulouse, France. As a result of these prizes, Mr. Dubois has performed in major concert venues throughout Europe, North America, Asia and the Pacific. His performances have included numerous international music festivals such as Cambridge, Stuttgart, Dresden, Vancouver, Montreal, Chartres, and Roskilde. Mr. Dubois has also appeared as guest soloist with several orchestras and ensembles, including the Philadelphia Orchestra, the Los Angeles Philharmonic, the Hong-Kong Philharmonic, the Orchestre Philharmonique of Radio France, the Orchestre National de France, the Orquesta Filharmonica del Gran Canaria, the Orchestre de Picardie, and the Orchestre de Bretagne. His performances have been broadcast over Radio France, the O.R.F. Vienna, CBC Radio Canada, Australian Radio and American Public Media’s Pipedreams. 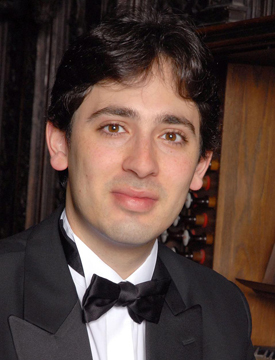 In addition, he has been invited to teach organ master classes at such prestigious institutions as Yale University, Curtis Institute of Music in Philadelphia, Oberlin College, Baylor University, St. Paul University, Emory University, and he was recently appointed Continuing Guest Artist at the University of Michigan in Ann Arbor where he continues with teaching residencies each season. Mr. Dubois has made several recordings, including a CD of the organ music of Franz Liszt available on the Vox Coelistis label; a CD on the JAV label recorded at St. Sulpice in Paris; and on the Radio France and Tempéraments label a recording at St. Etienne de Caen, which features the complete 3rd Symphonie of Louis Vierne and the Op. 7 Preludes and Fugues of Marcel Dupré. In addition to his extensive performing and teaching, Mr. Dubois has held the post of Director General of the Strasbourg National and Superior Conservatory of Music in France since March 2012.